When the Burns Family isn’t brewing beer, we are huge movie fans (reciting quotes from movies is a frequent pastime at Burns family gatherings!). So when Kristin’s parents told us about Manhattan Shorts, we were intrigued. We have attended the festival for the last three years … and we are hooked! Most places in the world, Manhattan Shorts showings are sold out–but in DC and NOVA it is hard to find a theater showing the shorts. Enter Old Ox…we found out that you don’t have to be a theater to show the shorts. What could be better than a movie and beer pairing?! So we invite you to Join us and more than 100,000 film-lovers around the world on Friday, October 2 and Saturday, October 3 at 8:00 p.m. for the 18th Annual MANHATTAN SHORT Film Festival. Watch 10 “Short” films from all over the world, cast your ballot for your favorite short and favorite actor or actress…then discuss your picks with friends and neighbors over a beer! 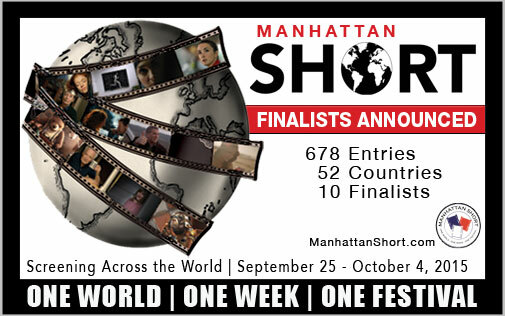 This year MANHATTAN SHORT received a record breaking 678 short film entries from 52 countries. The 10 Finalists hail from eight countries, with short films from Turkey and Kosovo representing their respective countries for the first time. Tickets are only $10 and can be purchased in advance here. These short films will not only entertain a global audience but will be judged by them as well. Cinema-goers will become instant film critics as they are handed a ballot upon entry that allows them to vote for the Best Film and Best Actor. This year’s MANHATTAN SHORT highlights the continued importance of woman in film. Half of this year’s selections feature actresses ranging in age from children to senior citizens. Audiences from last year’s MANHATTAN SHORT also will be pleased to see rising star Marleen Lohse once again in Forever Over making her the first actor, male or female to appear in consecutive years in MANHATTAN SHORT. Two other short films (Bear Story and Patch) are sophisticated animations, as MANHATTAN SHORT continues to support this important art form. And as always, MANHATTAN SHORT offers short films set in a wide range of locales, from the beaches in Turkey to the mountains of the Balkans to the streets of Berlin and the backroads of America’s West Coast. “In our 18 years of programming MANHATTAN SHORT, this is by far the strongest show we have ever had. From the first scene to the last, these films will command every second of the audience’s attention. It’s anyone’s gues who will win the Gold Medal.” said Founding Director Nicholas Mason.